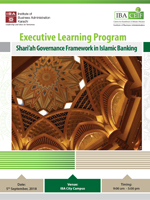 IBA Centre of Excellence in Islamic Finance is organizing a one-day training on “Shariah Governance Framework for Islamic Banking”. This course is exclusively designed to provide the participants a comprehensive and practical knowledge on Shariah Governance Framework for Islamic Financial Institutions of State Bank of Pakistan. It will highlight the relevant scope, procedures and potential issues in implementing an effective Shariah governance program for Islamic financial institutions.